In the Facebook search bar, try “YourCity writers workshop”, substituting nearby city/area names. You’ll want to try several and note (pen and paper) the interesting ones for followup. In my case, I found four critique groups for writers. Do the same at MeetUp.com and then pare down the results (more on this below). 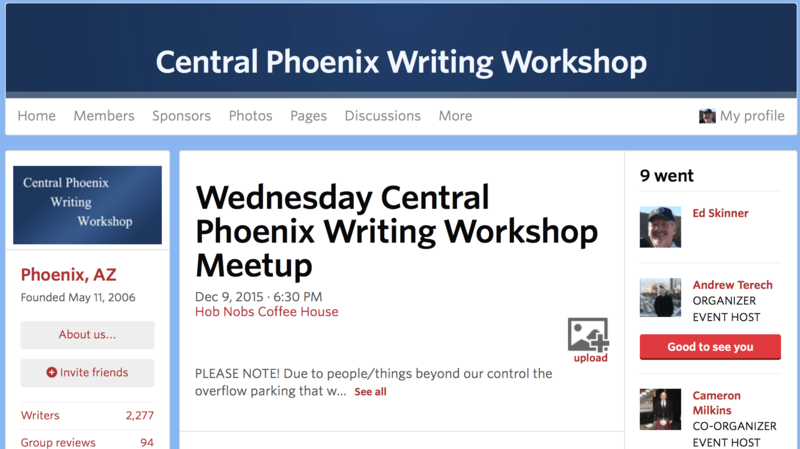 That’s how I found the Central Phoenix Writers Workshop. I chose this group as my first exposure to this process not only because the timing and location were convenient but, more so, because they were all male — My work is for males and about males. I wanted their perceptions as members of my target audience. Equally important, I wanted critiques, not just a pat on the back. And I knew that a reading, out loud, would be a key attribute. Last Sunday, I attended my first meeting at a coffee shop. They do their work in groups of 4-5 but, if more attend, they break up into smaller groups that are assembled on the spot according to word count. In each small group, authors read their material aloud and the others critique it making positive suggestions and constructive criticisms. My group was very positive and extremely helpful. Each author is expected to bring 4-5 copies for markup by the reviewers. These are returned after the reading when all comments have been discussed. On Sunday, I was in a group of four. The white-bearded, somewhat professorial gentleman to my left was a poet. Critiquing the first chapter I had just read aloud, he observed, “This reads like Young Adult fiction. For the target audience you stated, you may want to bring the reading age up.” (That means, among other things, I can use more multiple syllable words and compound sentences which I tend to do anyway.) He also suggested I try for more “colorful” verbs. (Type “synonym for said” in the Google search bar for suggestions.) When I noted my struggles with passive voice, his sage comments suggested that as I get more practice with active voice, this will pass. The third critique-r (?) was younger, maybe 30-ish. He pegged a formatting issue. He noted, and the professor-type agreed, that internal speech such as a character talking to himself — the character’s direct thoughts — should appear in italics. I have a lot of that and it was sometimes confusing in plain text. The italics decoration will help. As an unexpected bonus, he’d spent a couple of years in mainland China where my story begins. He pegged a couple of small but key mistakes that the if-you’ve-been-there readers would catch. At MeetUp.com, I noticed there’s a Wednesday evening group that promises to be larger than what I found last Sunday. I’ll attend tomorrow evening and take a different excerpt of about 1500 words with five paper copies to handout for markup. This entry was posted in Fiction by Ed Skinner. Bookmark the permalink.